1. Have fun this Valentine’s Day at a trampoline park. You can jump around, off walls, do a few flips here and there all while making fun memories with the person you love! And once you’ve fallen in love with trampolines, give us a ring. We can sort you out with your very own trampoline. 2. What’s better than an outdoor movie night? You don’t need to join the crowds at an outdoor cinema when you can make your very own on your trampoline. 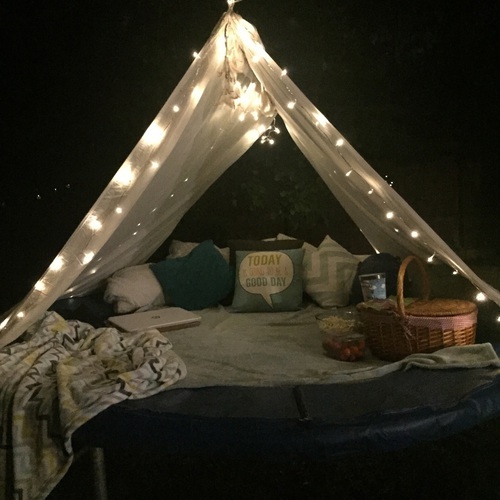 Just grab your laptop, iPad, or whatever portable screen you have and deck your trampoline out for the ultimate movie night under the stars! Throw on some pillows and blankets, load up on snacks and you’ll be in for an incredible night. If this sounds good, but you aren’t equipped with a good ol’ trampoline, don’t hesitate to contact us and we can get you sorted! 3. Looking into purchasing a trampoline but not confident on how to use it, or what type you’re after? Why not take your date to a trampoline lesson to learn all of the skills you’ll need once you’ve got your own! You can learn all the ins and outs, the latest tricks, and any safety tips required for trampolining. Mixing education and fun is totally in this year. 4. If you already have plans but are looking for the ultimate gift that says, “I love you,” what better gift than a trampoline? It’s the gift that keeps on giving as our range of products are top quality and will be there to make memories for you and your partner for a long time coming. You can’t go wrong! We’re all about spreading the love here at Topline Trampolines. We’ve been helping make memories in Sydney, Melbourne, Brisbane and beyond for around 50 years – so why not start making some this Valentine’s Day?